Here are a few pictures of our recent customer photographs that will give you some great gift ideas for Valentines Day. This year Valentines Day is on a Friday, so you can arrange for delivery in two possible ways. 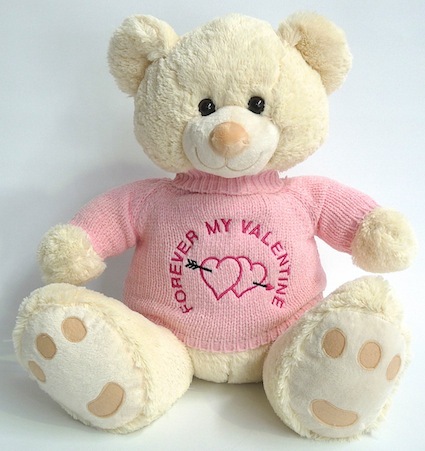 Have the teddy bear sent to you prior to Valentines day and stash it ahead of the day and give the teddy in person. 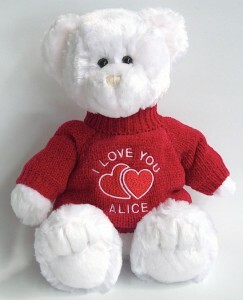 Or, arrange for the Teddy to be delivered on Valentines day to the workplace of your loved one, and wait for the call. Usually ladies love to receive a surpise at work, and to show their colleagues how unique and thoughtful you have been. Either way, a personalised teddy is a sure hit this Valentines Day if you are looking for a gift with real impact.